There is little more beautiful than the sight of the sun rising up over the mist of a land with rice tiers or the image of cherry blossoms drifting through the air in their serene dance or the crisp flash caused by ancient blades striking each other as mystical martial artists fly from bough to bough, competing for land or honor. The flowing silk garb worn by these astounding warriors are no less amazing and we’re often left wondering how they manage to keep them from getting caught up in the tree branches! That, itself, is a near miracle. That said… the destruction that they cause in their martial dance can be pretty devastating and quite dangerous to those trying to get a good look at their combat! Fortunately, you can save your eyes both from the more practical affliction of sun and rain but also from the debris that falls from these martial mystics with this Deluxe Chinese Bamboo Hat. 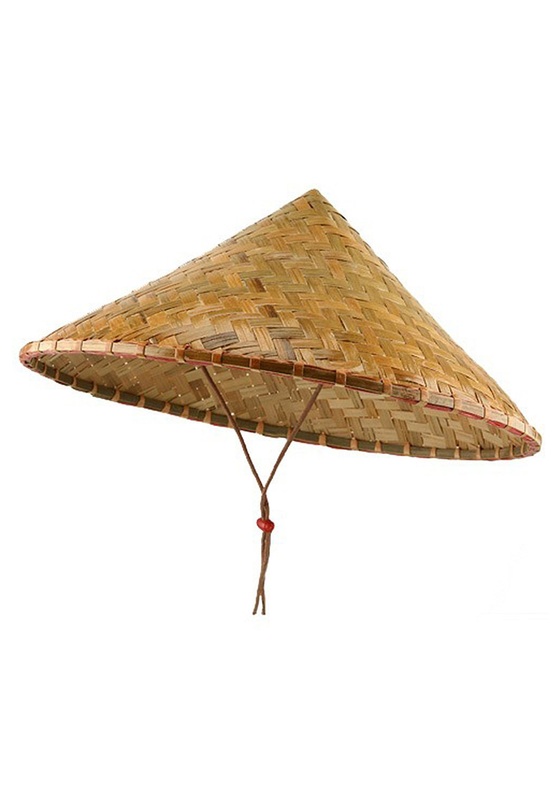 The design inspired by the Asian conical hat is made from 100% bamboo straw and features an adjustable chin strap for easy wear and will complement any such look, whether you are working in the fields and avoiding the sun, a spectator for a surprise ninja conflict above you, or even one of those mystical warriors!